ONE OF THE 13 original American colonies, the state of Georgia was founded by General James Oglethorpe under a charter signed by King George II of England in June 1732. Georgia is bounded on the east by the ATLANTIC OCEAN and SOUTH CAROLINA, on the west by ALABAMA, on the south by FLORIDA, and on the north by NORTH CAROLINA and TENNESSEE. The state is 300 mi (482 km) north to south and 230 mi (370 km) east to west. 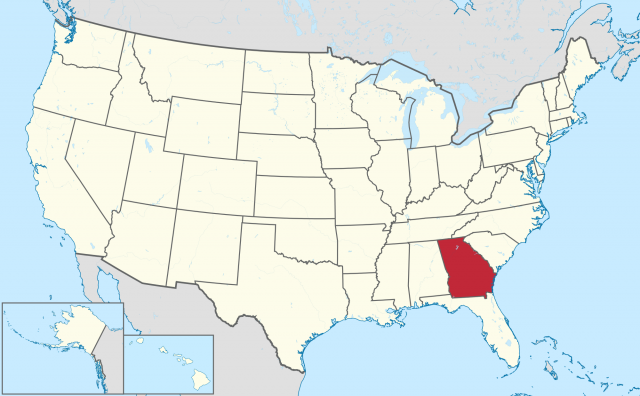 Known as the “Empire State of the South,” Georgia’s 57,906-square-mi (149,975-square-km) area makes it the largest state east of the MISSISSIPPI RIVER. It ranks tenth in population in the country. Atlanta (the capital), Augusta, Columbus, Savannah, Athens, Macon, and Albany are the largest cities in the state. Georgia’s climate is humid subtropical, with long, hot summers and short, mild winters. The state experiences rainfall throughout the year and snow falls occasionally in the northern section of the state, resulting in an annual average precipitation of 50 in (127 cm). During Georgia’s hot summers, low levels of precipitation may lead to drought. The mean elevation of the state is 600 ft (182 m) above sea level. Georgia has an annual growing season that ranges from 185 days in the mountains to 250 days in the south. Six physiographic areas make up the geography of Georgia: the Cumberland Plateau, also known as the Lookout Plateau, which is located in the northwestern section of the state; the Southern Valley and Ridge Region, which is an irregular section located between the Cumberland Plateau and the Georgia mountains; the Southern Blue Ridge Region, which includes sections of both the APPALACHIAN and Blue Ridge mountains; the Southern Piedmont Belt, which is located at the foot of the Georgia mountains, covering most of the northern part of the state; and the Atlantic Coastal Plain, also known as the Sea Island Region, and the East Gulf Coastal Plain, which together cover most of the southern half of the state. The section that divides the Atlantic Coastal Plain from the Piedmont is known as the Fall Line. In this area, the land abruptly drops to sea level, creating rapids and waterfalls that boats are unable to navigate. Georgia has four major soil areas: the Limestone Valleys and Uplands, the Piedmont Plateau, the Fall Line Hills, and the Coastal Plains. Overall, Georgia’s soils tend to be sandy and clay loams, ranging from gray to dark red, covering gently rolling hills. Georgia’s major rivers are the Savannah, the Ogeechee, the Altamaha, the Suwannee, and the Chattahoochee. The state has no large natural lakes, but a number of man-made lakes have been created by damming river waters. The largest of Georgia’s lakes are Lake Seminole; Walter F. George Reservoir; Lake Sidney Lanier; Lake Sinclair; Hartwell/Thurmond Lake, which is known as Hartwell in Georgia and as Thurmond in South Carolina; and West Point Lake, which Georgia shares with Alabama. Callaway Gardens, one of the state’s major tourist attractions, is located near the Little White House in Warm Springs, where President Franklin Roosevelt died on April 12, 1945. Callaway Gardens is located in Pine Mountain, the southernmost foothills of the Appalachians. Along with Florida, Georgia is home to the Okefenokee Swamp, also known as the Everglades, a 700- square-mi (1,812-square-km) area located in the southeastern corner of the state. The swamp was named by the Seminole natives who described it as Land of Trembling Earth. The eastern part of this swamp, which is called the Grand Prairie, is covered with various grasses and water lilies. This former Confederate state was once known for its cotton output. By the beginning of the 21st century, Georgia’s economy centered around the manufacturing and service industries. Atlanta, the largest city, is the major economic, communication, and transportation center of the American South. Also known as the Peach State, Georgia’s farm products also include cotton, peanuts, tobacco, pecans, onions, corn, eggs, and soybeans. The state leads the nation in the production of paper and board, tufted textile products, and processed chicken and provides more than half of the resin and turpentine products for the entire world. Approximately 67 percent of Georgia is forested with trees ranging from the southern pine forest that is home to slash and longleaf pines and live oaks to the cypress and tupelo found in the Georgia swamps, to the hardwoods found in the northern section of the state. Georgia’s flowering trees include the redbud, the dogwood, and the azalea. Wild animals found throughout the state of Georgia include deer, raccoon, opossum, fox and squirrel; black bears reside in the mountains and the southeastern section of the state. Game birds include ducks, geese, and quail, while the mockingbird and the wood thrush are the state’s most common songbirds. Minerals found in the state include kaolin, granite, coal, sand, gravel, talc, soapstone, barite, bauxite, manganese, and clay.